Have you ever heard of Meet Up? Today I went to my first Meet Up group. They have groups for statistics, socializing, assorted languages, hiking, and a bunch of other stuff. I went to a group that meets up for around an hour and talks in Spanish. I didn't know what to expect. All of the people in the group were complete strangers, but it was fun. I never practice Spanish in my daily life so this will help me keep my Spanish from becoming rusty. 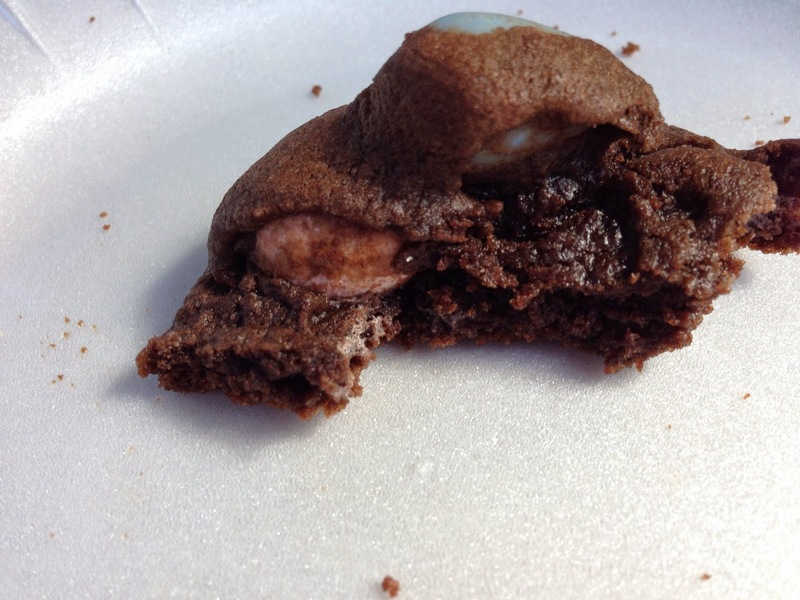 The ingredients are 2 full cups mini Cadbury eggs, 1 cup softened butter, 1 1/2 cups granulated sugar, 2 eggs, 2 teaspoons vanilla, 2 cups flour, 2/3 cup cocoa powder, 3/4 teaspoon baking soda, and 1/4 teaspoon salt. I began by creaming the butter and sugar. If I continue blogging for a few years, I'll probably write the preceding sentence many, many times. After the butter and sugar was creamy, I added the vanilla and eggs. I stirred until this beautiful batter formed. I added the baking soda, salt, flour, and cocoa powder. Cocoa powder is what remains after the cocoa butter has been removed from the cocoa bean. I stirred all the ingredients together. After the batter was smooth, I added the chocolate eggs. I had to taste test a few times to make sure the cookie batter wasn't poisoned or anything. I let the batter sit in the fridge for 24 hours. That's what all the legitimate cookie bakers do. I than heaped 1/4 of a cup of dough into globs on a sheet pan. These cookies didn't spread much. I think because the dough was cold when I put it into the oven. This is really a great cookie recipe. Mini Cadbury eggs are freakishly addictive, and the cookie dough has like a million likes on allrecipes. The candy coated eggs provide a yummy crunch, kind of like nuts would. They also had huge chocolate flavor. 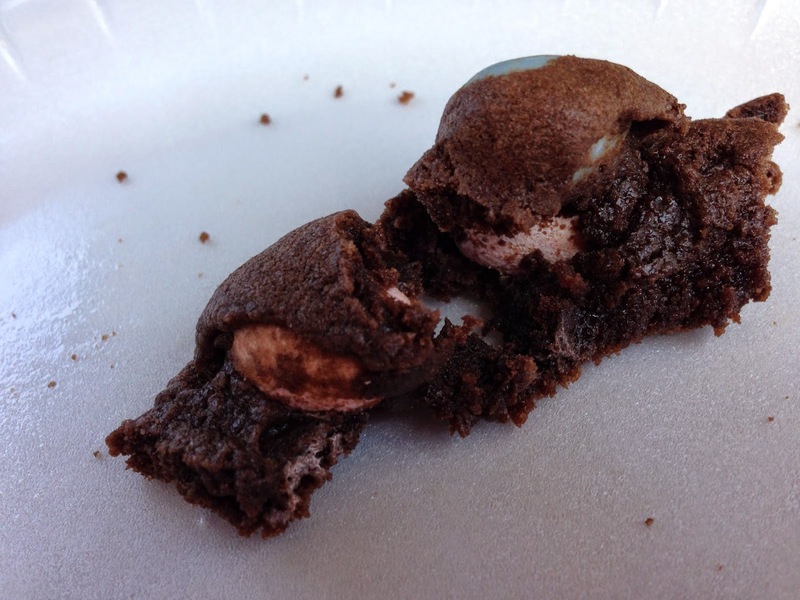 The chocolate chunk to cookie ratio is around 3 part cookie to 1 part chocolate egg. These are a rich, super chocolaty cookie. Lindsey, I have been signed up for over a year, and this was the first one I've been too. It is a little nerve racking to go somewhere with complete strangers! I'm enjoying your blog! Those cookies are interesting -- especially the base. It has lots of cocoa powder, so I'll bet it's good. I think I might try it with Ghirardelli 63% Bittersweet Chips. Thanks! The base cookie is amazing. I have made is several times, and it tastes great!